“Bacon Pancakes, making Bacon Pancakes. Take some bacon and I'll put it in a pancake. Bacon Pancakes, that's what it’s gonna make. Bacon Pancakes! !” If you’ve never heard the song before you need to remedy that immediately. If you have heard it, then you already know that Finn and Jake clearly love their food in Adventure Time and just in time for National Bacon Lovers Day, here’s a recipe for Jake’s signature dish to go along with his catchy tune. Dice the bacon and cook in a skillet over medium high heat until crispy. Drain and set aside. In a medium bowl whisk together the flour, sugar, brown sugar, baking powder, cinnamon, and salt. Make a well in the center and add the milk, eggs, vanilla and melted butter, stirring together until just combined. Fold in the cooked bacon. On medium high heat, prep a griddle by greasing it with butter. Pour the batter into a large circle. Once small bubbles appear in the batter and start to pop, flip the pancake. Cook until browned and cooked through. Pour more batter into a smaller arch shape, wait for bubbles, then flip to cook until browned. Place the upside-down u-shape on top of the round pancake. 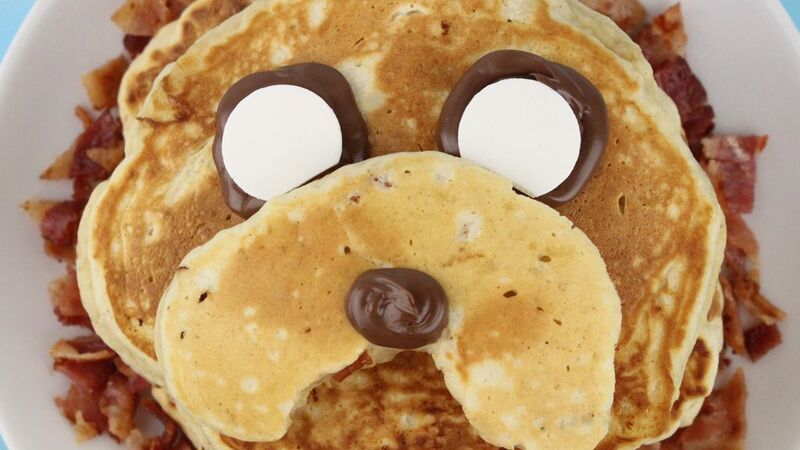 Spoon Nutella into an oval to form Jake’s nose, then two circles to form the base of Jake’s eyes. Finally, add the white candy melts for his pupils and serve.